Technology in Motion is a highly experienced and respected provider of Orthotic treatments in the UK. 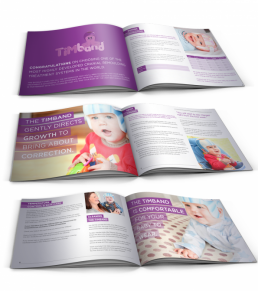 TiMband is just one of the corrective treatment technologies provided by Technology in Motion which specialises in cranial remoulding helmets for babies. As part of this treatment, Orthotic Clinics provide parents with a Treatment Package containing key information for every step of the TiMband treatment. To ensure parents clearly understood the information presented, it was felt that a complete redesign of the package was needed. Itchypalm understood the challenge was not only a matter of redesign, but to also ensure an approachable style that was easy for parents to follow. The result was an informative, accessible Treatment Package containing multiple subject specific booklets. As an on-going client, Itchypalm have also designed HTML emails and A2 posters for Technology in Motion, and continue to develop communications for TiMband.